Captain Brown, 36, was shot to death while attempting to arrest an armed robber. Responding to the report of an armed robbery near Brigham City, officers were fired upon by two suspects who eluded them in the dark. A search the following day resulted in the discovery of the suspects in the foothills above Willard. A gunfight ensued during which one of the suspects and Captain Brown were shot and killed. The surviving suspect, who fired the shot that killed Captain Brown, was convicted and sentenced to life in prison. He was paroled in 1918. 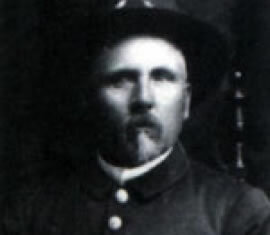 Survived by his wife and five children, Captain Brown was buried in Ogden City Cemetery. His bronze name plaque is sponsored by Ogden City Corporation.